WordPress is one of the most popular, robust and versatile content management systems (CMS) available right now. There are many reasons why lots of businesses lean on to WordPress to help them establish their online brand starting with their website. However, arguably the best thing about this platform is that it allows you to effortlessly create any type of website even if you have no HTML or coding knowledge. You can set up an online shop or build a blog in a manner of minutes and get something published in a jiffy. Even though WordPress has a wide list of features, another thing that stands out about WordPress is it being amazingly SEO (search engine optimization) friendly. WordPress SEO: Why optimize your site in the first place? 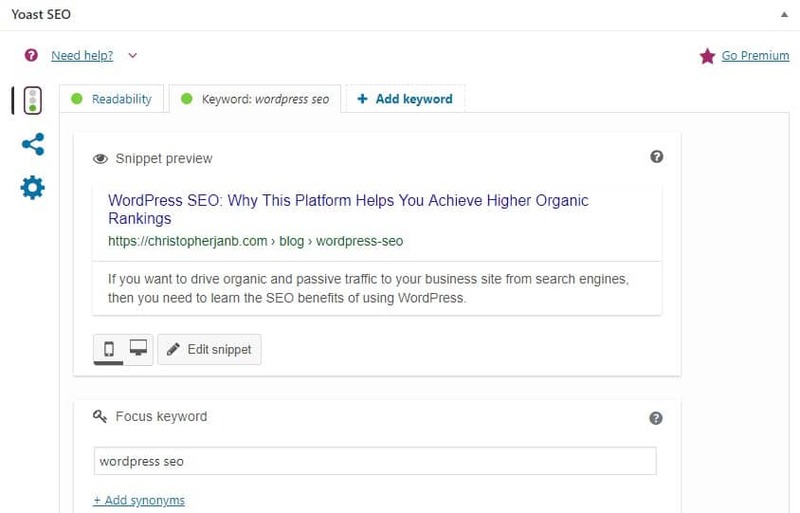 Are you ready to take your WordPress SEO to the next level? SEO is a set of rules that website owners must follow to optimize their websites for the search engines and thus improve the search engine rankings. It also provides them a great way to increase the quality of their website by making them user-friendly and easier to navigate. SEO is good for the branding of your business. You will always want to appear as much high as possible in the search engine rankings when people search for your products and services. Staying constantly in the search results will enable you to gain more mindshare with each potential customer. There are many other ways in which SEO is important for your business. Now let us discuss the SEO benefits of using WordPress for your business website. Content acts as the biggest driver when increasing SEO rankings are concerned. The last thing you need is a platform that makes it difficult to publish content and share it with your audience. 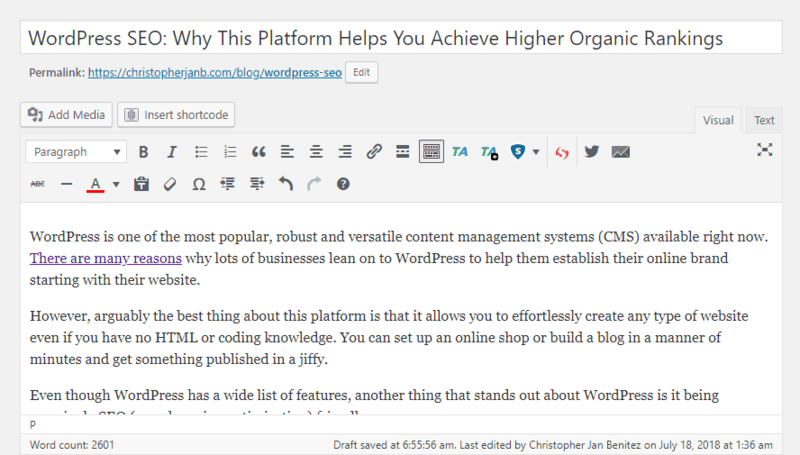 Thankfully, WordPress isn’t that kind of platform. In a blog post, you can add a title with your keyword including some links and tags to link within the pages of the post. Publishing your content will make you feel confident about the presence of your content. Doing this regularly will draw more people to your website and boost it even more. The WordPress editor is the same as using a Word document which makes its usage simple. Thus, optimizing the content based on on-page SEO factors becomes very easy. In WordPress, links are termed as Permalinks. Permalinks define the way your URLs look and are displayed to the users. All the URLs of your website can be easily customized which is a very important aspect of SEO. When a post or article is generated in WordPress, an URL is immediately created. WordPress allows you to make SEO-friendly URLs or permalinks. These SEO friendly URLs contain keywords that explain the article and are easy to read by both humans and search engines. Search engines like Google spot these keywords. They improve the chances of a website to rank higher in the search engines. You can do this by going to Settings > Permalinks from your dashboard. Make sure that you choose anything other than “Plain” and “Numeric.” You want your URLs to be editable so you can include your target keyword there. It also helps that users can read the URL of your post so it’ll be easier for them to remember the link. WordPress being open source means that as a user you don’t have to pay any license fee or subscription fees to use it. Being open source also means that it is constantly updated. There are a large number of smart programmers and developers who are always working on WordPress to make it better, up to date and SEO-friendly. As a business owner, you are benefiting from this. All the programmers constantly work on the software and try to integrate new features in the form of updates. All these useful additions will be useful for your business in some way or the other. WordPress out of the box comes with a very clean code. However, once you start downloading and using plugins and themes to your site, the code gets bloated by unnecessary lines of command. This is purposely done by the developers as they hide links in the code, linking back to their websites. Google spots this and applies a warning in the SERPs to the affected site. This would be bad for your business and you may end up getting penalized for this in the rankings by Google. So it is better to use premium WordPress themes as they are highly secure and free from all the malicious elements. One of the best themes to use is the Genesis Framework. 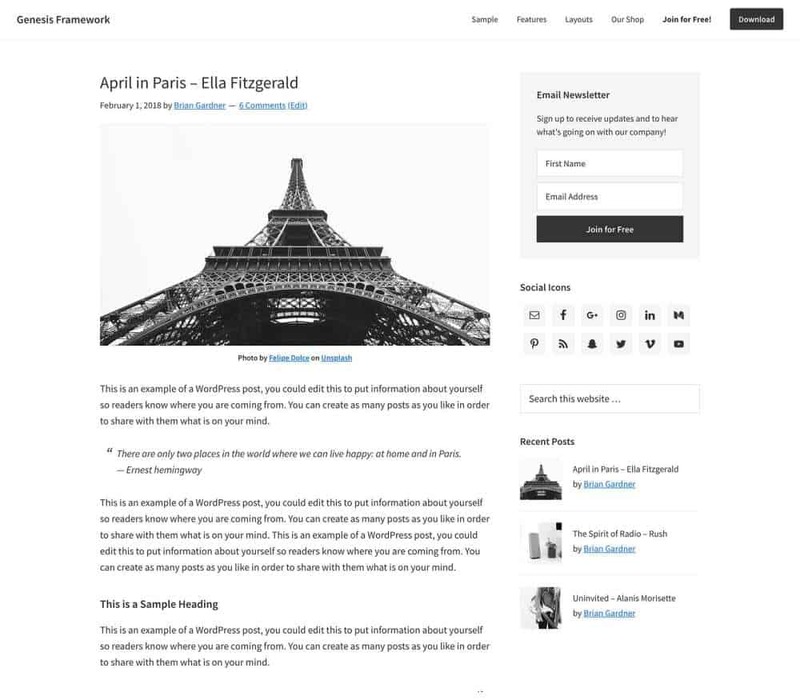 While it works as a framework where all StudioPress themes work under, you can purchase a copy of this Framework and use the child theme for your site. There is beauty in simplicity and the Genesis Framework is a testament to this saying. There are no unnecessary features included in the theme found in others which makes your site load faster. The code is clean and secure so you improve the chances of your site getting hacked. Best of all, it is easily customizable to help you achieve the look and feel that you want for your site. For my site, I am using Genesis Framework with Beaver Builder (affiliate link) to create a site that looks good in the eye (at least that’s what I think) and is functional enough that users can easily navigate its features. RSS stands for Really Simple Syndication. However, often it is referred to as a news or news feed. Every WordPress website automatically publishes RSS feeds for content and comments. RSS feeds help to improve SEO by sending your content to a feed directory with a link coming back to your website. RSS feeds enable your readers to subscribe to your feed. By this, they can read your blog as and when you post new content. WordPress comes with a built-in RSS feed which is a very powerful SEO tool. RSS feeds aren’t really useful in an SEO sense. They help you syndicate your content much easier and help spread your content to different channels. But besides that, there’s no SEO value in RSS feeds, at least not anymore. WordPress has a library consisting of thousands of plugins which provides additional functionalities to your site. This is a help to both the webmasters and the end users. Before, you would have to hire a programmer to add these additional functionalities to your website. Now, whatever feature you want to add to your website, you will probably find a WordPress plugin for it. Go to Plugins > Add New and search for possible plugins that can solve your website problems. There’s almost a plugin for every situation on your website that you can possibly think of. Just choose the one you like best, install in your site, and activate. It’s that easy! WordPress has quite a few numbers of SEO plugins that are available, one of those tools I will discuss in the latter section of the post. The purpose of SEO plugins is to make your site much easier to index by search engine spiders. They cover a host of issues that you need to attend on your site to ensure that it is optimized to the fullest extent possible. SEO also deals with site speed. The faster your site loads, the higher its chances for ranking on top of search results for its keywords. Therefore, it is imperative that your site loads as fast as possible. To help you achieve this, I have written a post on RankPay about the must-have WordPress plugins to increase loading speed. Click here to read the post. As an open source project, WordPress always undergoes updates and changes by its very dedicated team. Part of the updates made regularly by the team is to make WordPress safe and secure as possible. There are many factors that affect WordPress security such as web hosting as well as options in your WordPress dashboard that you can tweak and change. WPBeginner goes in-depth with the different factors that you can manipulate in your site’s settings so you can create a safer environment for your website and prevent hackers from stealing your data. However, if there’s a plugin that you can use to help beef up your WordPress security, then you can’t go wrong with MalCare. The plugin deep-scans your site for hard-to-find malware that’s destroying your website and compromising its security from within. You can scan your site without compromising its speed on your users’ end. There’s also a one-click clean-up function that allows you to remove malware in an instant. 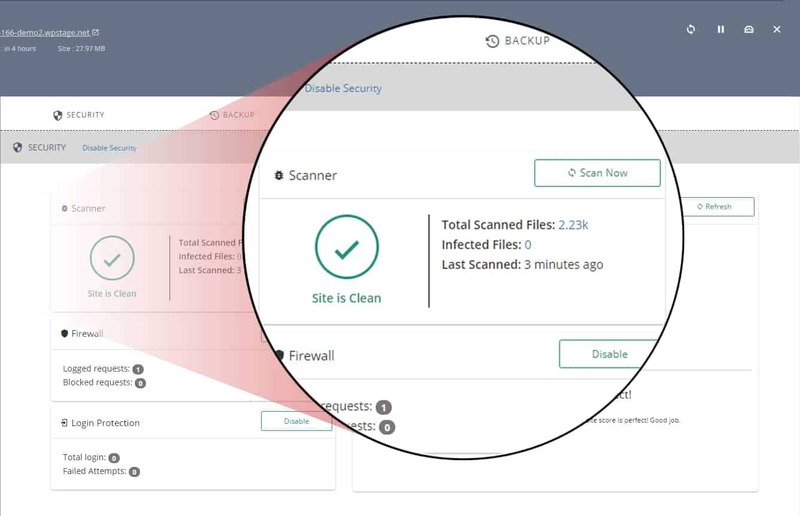 In the event that your site is compromised beyond your control, you can set a backup file using MalCare so you can put up your site in an instant. Visual content in form of images is an integral part of any website. Most of the visitors get attracted to visually appealing website designs. When you add images to your blog page or post, a little window will appear where you can add an image title and the image alt text. Google cannot read images and has no way of knowing what an image is. Thus, adding an image title and alt text will give you another way to add your keywords and also help Google in identifying the image. You should make sure that the image is as small as it can be in terms of download size by using the correct image compression. 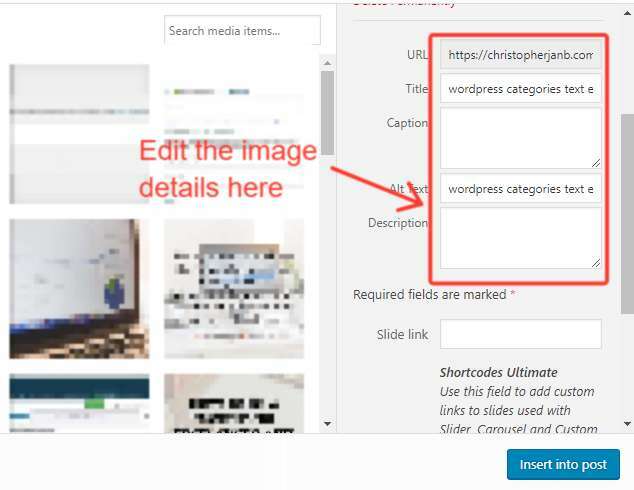 Assuming that you haven’t compressed the images you uploaded on your WordPress site, you can download the EWWW Image Optimizer plugin. It will automatically compress all the images you upload so you don’t have to. Better yet, the plugin will compress previously uploaded images to make them more efficient to load and increase loading speed, which is good for SEO! Categories will allow you to automatically arrange your content in the form of folders or directory on your website. This will be of a great help to a visitor as it would enable him to easily find an article published on your website. There is no point in having a website with disorganized content because the visitors will start looking for better alternatives. A website which has information presented in a well-organized manner is favorable not only for users but also for the search engines. It will also help in indexing your website on Google or any other search engine. To help organize your content, you need to create the different categories for your site first. Consider the different topics that you want to cover on your blog. For example, a blog about SEO would want to write about link building, on-page SEO, content marketing, and others. These will serve as your categories. Enter the details of your category here. The slug refers to its URL (i.e. site.com/category/slug). 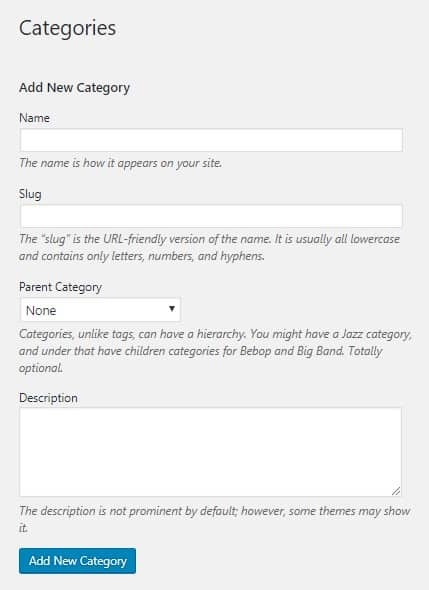 You can organize your categories even further by creating parent categories for subcategories. Once you have created the categories, they will appear on the right side of the post text editor. Tick the boxes of the categories that the post fits in. All of these options aim to help you create a better structure for your website so search engines can index your site faster and users can browse through your content more conveniently. Whenever you publish or edit a blog or posting, your WordPress website will alert a range of different websites that are listed under your ping update service. This way, the ping services get notified about every new post and the search engine will index them. This is pinging and is very valuable in helping your website getting ranked in the search engines. WordPress has a built-in function which automatically pings search engines, blog directories, and RSS feed sites. To view your ping list, go to Settings > Writing and scroll down the page until you see the Update Service section. If you don’t have lots of entries in your ping list, then I suggest that you add as many as possible. If your post pings lots of sites, then you can get spiders to take notice of your content and immediately rank it for the appropriate keyword! Luckily for you, I have prepared a FREE list of ping sites that you include in your list. Just copy the list from the Notepad file and paste it on the Update Services of your WordPress dashboard. Click “Save Changes” and you’re good to go! However, I would kindly like you to share the post first by clicking on any of the social media buttons before to unlock the link where you can download the ping list. It’s a small price to pay to help you get your WordPress site pages indexed faster. CLICK HERE TO DOWNLOAD THE PING LIST! Metadata are the information found on search engine result pages (SERPs) for a web page. Also referred to as rich snippets, they help search engines identify what the page is all about. It also helps users learn more about the page before clicking on it. Here’s an example of a search engine result page. Each page has a metadata or rich snippets that provides information about its content to help users make an informed decision and determine which among the results they should click. It is best if your page ranks on the top ten or first page of search results for your target keyword. However, you can still get more people to click on your page if you have compelling metadata on your site. 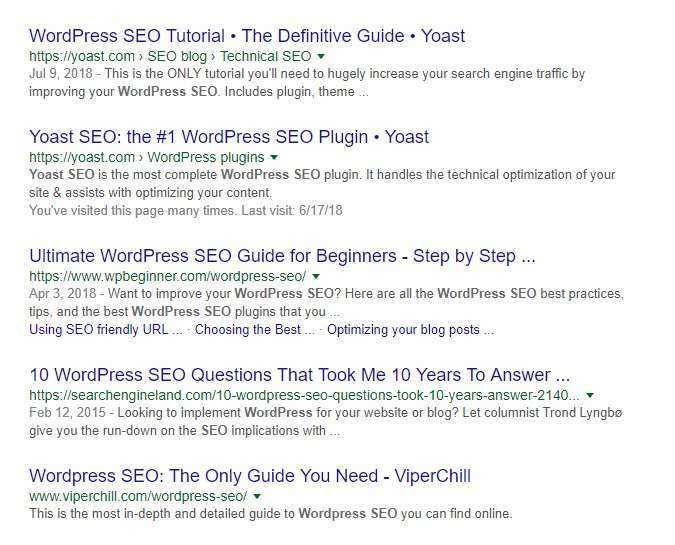 To help you build rich snippets for all your posts, you need to download and use the Yoast SEO plugin. It’s arguably the best free WordPress SEO plugin in the market as it helps you optimize your site based on different on-page factors. Fill out the focus keyword that you want the post to optimize for and enter the title and description of the post. It’s best to include the target keyword in both to increase your chances of ranking higher on organic search. There are many benefits which Google sitemaps have for the website owners. It helps the visitors to see an outline of exactly what they can find on the website. Sitemaps will let you place web pages under categories. Pages that carry important content will be crawled and indexed faster than those which have less priority. A sitemap is recommended for new websites or web pages it will allow them to be discovered fast. Monitoring your sitemap reports will help you learn a lot about your visitors. This information will help you improve your content and attract more traffic. 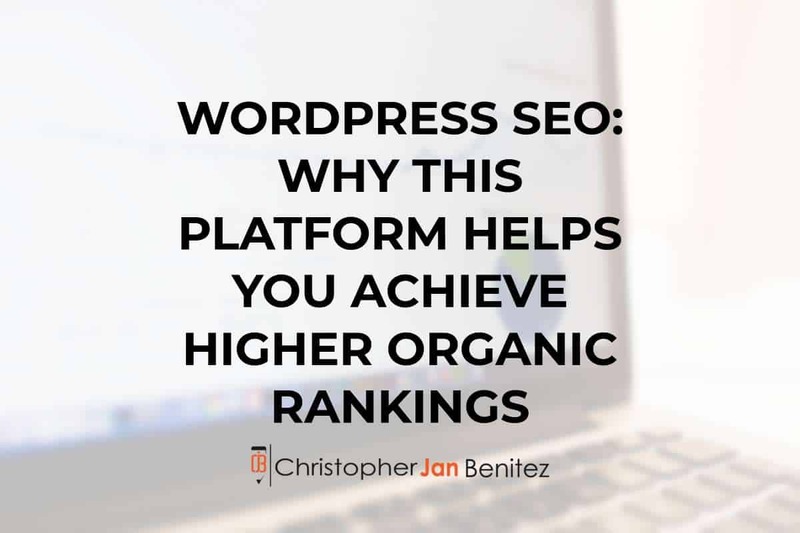 From the above points, it is clear that WordPress is very beneficial for your business website from an SEO perspective. Owning a website is not enough as you will have to generate traffic and create awareness of your website. Creating a loyal base of your visitors is necessary for the constant growth of your business. Let me know if I have neglected any of the important benefits that should have been mentioned along with the above points, in the comments section below. 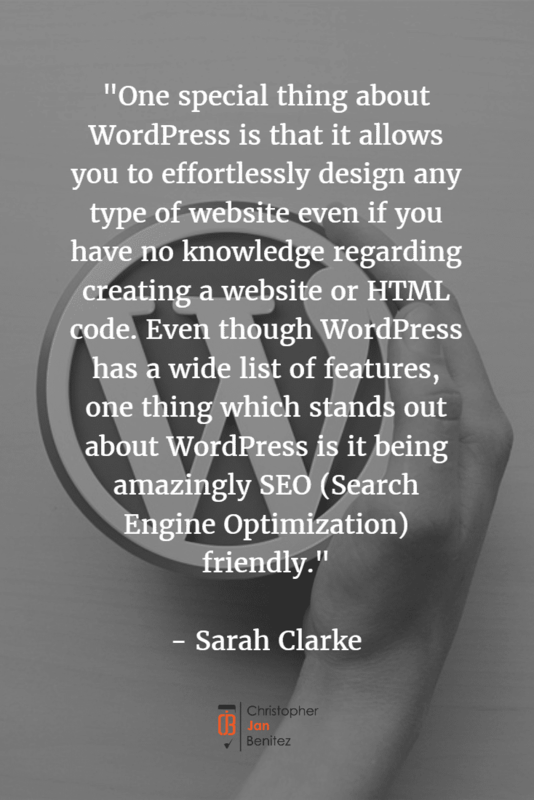 Note: Sarah Clarke, professionally qualified WordPress developer at WordSuccor Ltd., a renowned firm providing PSD to WordPress Conversion Services, originally wrote this post. However, I have rewritten some parts of the article on July 18, 2018 to update its information.